Strong Holding Force, resistant to corrosion, protects against surface damage. The arrangement of magnets and the rubber coating is ideal for use on surfaces which should not be scratched and / or where movement or slippage of a normal metal pot magnet system is a problem. This makes its use recommended for painted or varnished articles, or for applications where a strong magnetic force is needed, without marking or scratching surfaces.The multi-pole structure of the magnets ensures a dense magnetic field on the holding surface. This allows good holding on thin surface eg. lacquered car body metal. 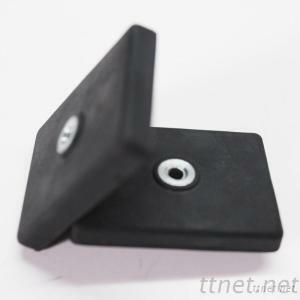 The side displacement forces are extremely good due to the suction effect of the rubber surface.The rubber protects the magnet in humid conditions where corrosion is likely. The holding force is not weakened even after years of use. Electrical Components & Equipments, Magnetic Materials, Magnetic Materials/n.e.s.